Unfortunately, C.S. Lewis seems to be one of the world’s most misquoted authors, at least on social media. 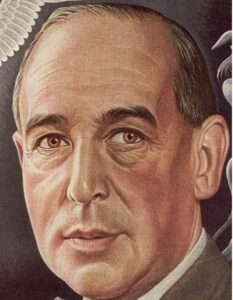 For the past few years, William O’Flaherty from EssentialCSLewis.com has been documenting false Lewis quotes, researching their actual origin, and setting the record straight. NarniaWeb supports the effort to prevent these errors from spreading further. If you are ever doubtful about the authenticity of a quote attributed to C.S. Lewis, post it on the Confirming C.S. Lewis Quotes Facebook page. View more reported false quotes here. And, check out the new series about William’s research on the All About Jack podcast. Yay my fav one isn’t on that list! I’m actually glad Lewis didn’t make the soul quote. We have a body AND a soul. That’s my story and I’m sticking to it. That is a good point. I’d actually heard that soul quote attributed to Lewis before, but since the quote is not completely accurate I’m glad it wasn’t really invented by Lewis.